This Statue of Nicholas I is in front of St. Isaac's Cathedral on St. Isaac's Square, not all that far from the Bronze Horseman (and almost as impressive as the Bronze Horseman!). 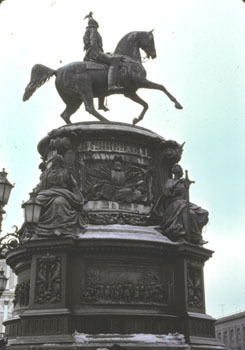 The statue, the work of Auguste de Montferrand and others, was commissioned by the tsar's wife and three children and depicts the tsar mounted on a rearing horse. Unveiled in 1859, the statue also includes references to the codification of Russian law, the suppression of the Decembrists and the opening of the St. Petersburg-Moscow railway line. Read the textbook chapters 26 and 27. Read Nicholas' manifesto ending the Polish constitution in 1832. Check the remarks by Professor Blois and Professor Evans on Nicholas I. Read the notes by Professor Hammond on "Nicholas I," (These are very detailed lecture notes. ), and also his shorter "Russia in the Time of Nicholas I." (*.pdf files) There are also some notes on the Russian secret police and the elaborate exile system that was used during the tsarist regime. In some respects, it really was Nicholas I who put this altogether, and Hammond, in these extensive notes, has some of the interesting cases of people who were snared by the Russian police. Lenin, when he set up the first secret police organization of the new Bolshevik regime in 1918, had a great model to copy in what the tsarist regime had accomplished. Read chapter 21 and chapter 22 from Mary Platt Parmele (1843-1911) A Short History of Russia (1907, 4th edition). These are short chapters, and this is optional reading. Professor Nicholas Riasanovsky has published a number of definitive works dealing with the reign of Nicholas I. Read some of Riasanovsky's reflections on his long, and continuing, study of Russian history in *.doc or *.pdf format. For 50 points maximum extra credit, read Nikolai Gogol, Dead Souls (1842) and write a one-page paper in which you explain why this novel had such an impact of Russian society when it was published. For 50 points maximum extra credit, read Mikhail Lermontov, A Hero for Our Time (1840) and write a one-page paper in which you explain how the main characters reflected Russian society of the 1840s. For 50 points maximum extra credit, read Aleksandr Pushkin, Eugene Onegin (translated by Vladimir Nabokov, 1991; There is also an online version (translated by Charles Johnston) and and write a one-page paper telling me why this is such as great piece of literature (even in translation). For 50 points maximum extra credit, read Nicholas Riasanovsky, Nicholas I and Official Nationality in Russia, 1825-1855 (1959) and write a one-page paper explaining the main tenets of the ideology of Official Nationality. For 25 points maximum extra credit, read Tsar Nicholas I: Imperial Manifesto on Poland, March 25, 1832 and write a paragraph that answers the question, What was the underlying political rationale for this Manifesto?